I had read this book quite some time back but, due to some unforeseeable turn of events, I was not able to post the review on this space. 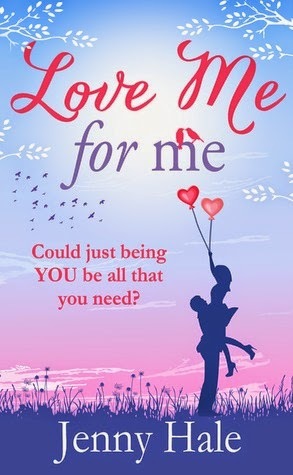 As the saying goes – ‘better late than never’ – here I am with the review of Jenny Hale latest book – Love me For Me. I would like to thank Kim from Bookouture for sending this review copy in exchange for an honest, unbiased review. To give you an idea of the plot in the novel, I am quoting the blurb from the back cover. Libby Potter has just lost the perfect job, the perfect apartment and the perfect boyfriend. Moving back to the same home town that she couldn’t wait to escape when she was younger was definitely not on her to-do list. Especially as it means running into the man whose heart she broke when she left. It was an easy, somewhat emotional and quite enjoyable read. The author knows how to get the readers involved in the story. There are many incidences and characters in the novel that I could relate to. At first, I felt pity for Libby – her great life in New York is suddenly torn to pieces. She is so unsure about what she wants in life that, at times I did feel like shaking her up. Then slowly things change and she begins to doubts her own thoughts, desires and dreams and starts seeing things in a new perspective. If I had to tell about the story in one line, I would say it is the story of the self-discovery of Libby Potter. And this Libby could be any one of us! Very often we live our life the way others want us too and in the process, we often forget what we truly desire. Many a times we think that if we have certain things or if we meet certain goals, we will be happy. But, that is not true. Our perspectives, our dreams, our needs often change and if we can understand and accept that, our lives can be so much simpler and enjoyable. There were times when I could not understand why Libby acted the way she did. Of course, her thoughts seemed quite influenced by her mother, who had her own demons to fight. Then there is Pete, who tries hard to be nonchalant all the time and I hated him for that at times. But, then he also had his reasons. All the characters in the novel gel quite well in the overall story and that makes it a satisfying read. This book gives you an important lesson in life. All that glitters is not always gold and that grass on the other side is not always greener as it seems. Sometimes, we do have to take a step back to evaluate things and make important decisions of life. I loved the way the author ended the story – there could not have been a more fitting way.